This and other cases can also be accessed by clicking on the Case of the Week button on the left hand side of our Home Page at www.PathologyOutlines.com.� This email is only sent to those who requested to be on this list in writing or by email.� To view the images or references, you must click on the links in blue. 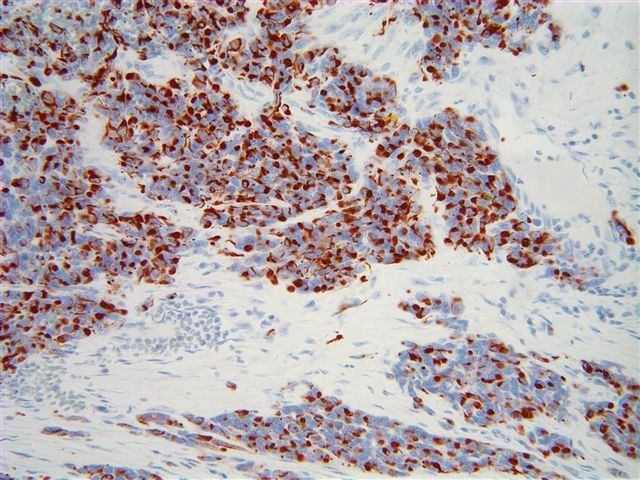 This week�s case is sponsored by Invitrogen.� Invitrogen offers Zymed� total system solution for pathology reagents and automation.� From antibodies, kits and probes for IHC and CISH� to immunostainers for automation, you can be confident that Zymed� products will always deliver high quality staining results and offer the cutting-edge pathology solutions you need. �Visit www.Invitrogen.com/pathology.� Note: sponsors do NOT have access in any manner to email addresses or other personal information in the possession of PathologyOutlines.com. 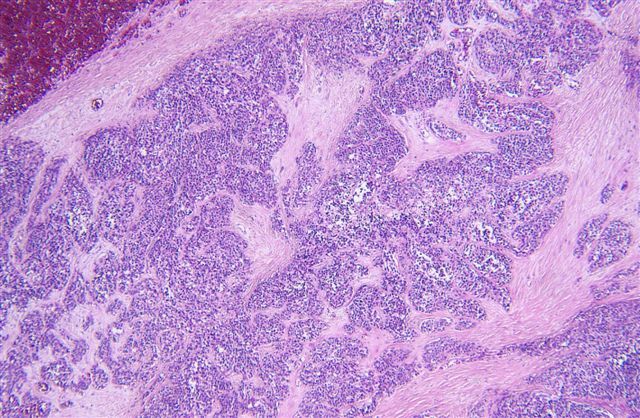 A 31 year old woman presented with a 14 cm pancreatic mass.� Small nodules on the peritoneal surfaces were considered clinically to represent metastatic disease.� Based on the frozen section diagnosis of poorly differentiated endocrine carcinoma of pancreatic origin, the patient underwent subtotal pancreatectomy. Desmoplastic round cell tumor is a rare and aggressive tumor of young males, usually of the abdomen or pelvis.� It has also been reported in the pleura, thorax, paratesticular region (Urol Oncol 2005;23:132), kidney (AJSP 2004;28:1379) and CNS, but has not been previously reported (to our knowledge) in the pancreas.� Patients typically present with large, symptomatic masses, and may have widespread peritoneal tumor implants.� The prognosis is usually poor. Histologically, these are small round blue cell tumors composed of solid nests of round/oval cells surrounded by cellular desmoplastic stroma.� There is frequently necrosis, cystic degeneration and glandular arrangements, and the tumors may contain signet ring-like cells, pseudorosettes, rhabdoid cells and spindled cells. These tumors almost always have the translocation t(11;22)(p13;q12), which fuses the WT1 and EWS genes, leading to production of a chimeric protein with transcriptional activity that activates expression of target genes normally repressed by WT1, such as platelet-derived growth factor A and transforming growth factor-beta. 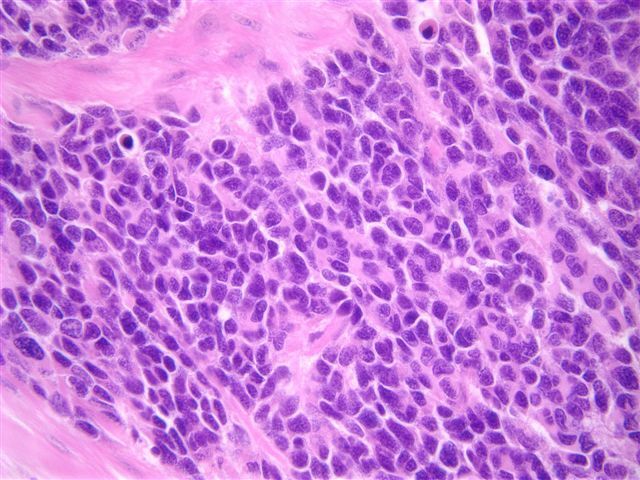 These tumors are typically immunoreactive for desmin, keratin (CAM 5.2 or AE1-AE3), WT1 (AJSP 2000;24:830)� and often for PLAP and MIC2/CD99, with variable immunostaining for calretinin, myoglobin, HER2 and c-kit/CD117 (Mod Path 2003;16:229).� The morphology and immunohistochemistry profile are usually sufficient for differentiating from other small blue cell tumors.� If necessary, molecular identification of the characteristic translocation can be performed.